Welcome, class. 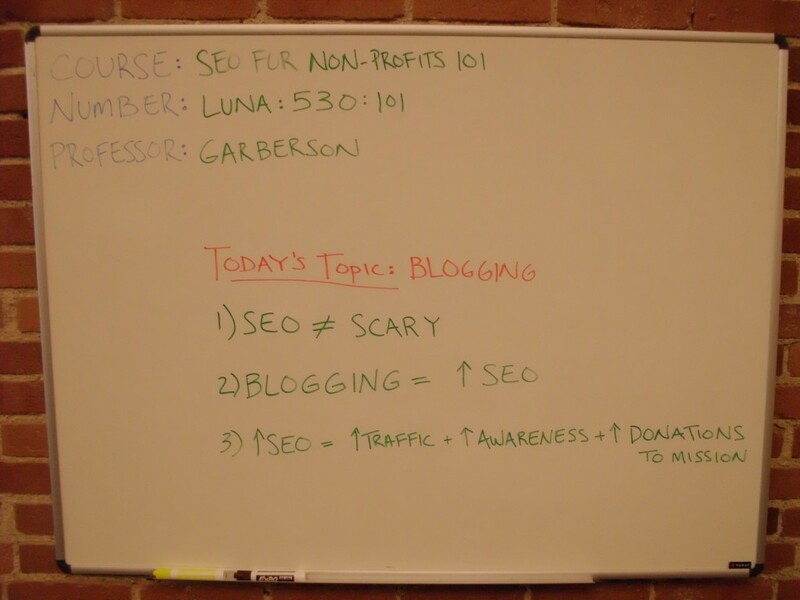 Today in SEO for Non-Profits 101 we are discussing how organizations can use a blog for SEO. I spent enough time in the non-profit sector to know that there is hesitation to adopt business practices. But fear not, dreamers and do-gooders. I assure you that SEO is not corporate witchcraft that should be avoided to preserve idealistic innocence. It’s actually quite the opposite. SEO is all about answering questions. Internet users take their queries to Google 1 billion times per month in search of an answer. Google scans for the best possible information and presents it in descending order based on relevance. So, when someone searches for information about [insert your mission here], Google relies on SEO to rank results. Christina Keffer and I recently covered why blogging positively affects SEO on LunaTV. It’s a good perquisite to this article, which focuses more on how than why. If you don’t need to brush up, let’s get started on how to optimize your blog for search. Title is number one. It might not be where you start as a writer, but it should be where you spend a good portion of your time. The title is what makes or breaks an article. The line between flair and function can be fine because boring never gets a click and too flashy is not search engine-friendly. Read Christina’s post on keyword choice factors then consult a great general writing blog for advice to authors about selecting the perfect title. Article length is crucial because search engines favor longer word counts. Can you blame them? It’s rare that a page with 150 words conveys resourceful information. You might have read my rant about blogging brevity and are now accusing me of flip floppiness. Put down your accusatory pointer fingers and hear me out. We might be living in the age of Tweets and texts, but it is still difficult to argue a point in less than 400 words. That’s all I’m saying. And it’s fine if you don’t agree because the search engines do. Headers and bold font guide readers (and search engines!) to useful information by helping them skim the page. There are a couple rules to follow with headers that many writers, editors and webmasters forget. The <h1> tag has the most SEO weight, and you can only use it once, so choose carefully. Other subheadings should call on tags that decrease in order like a middle school essay outline–<h2>, <h3>, etc. I am happy to answer most header-specific questions. The only one that I won’t answer is “How many <h1> tags can I use?” It shows that you were dozing off in class. Internal links never get the love that they deserve. Contextual link building, or an in-text link to a related page or article on YOUR website (like the one above in orange), is a gem when used in moderation. It offers your audience background information about the subject while providing off-page context for search engines. External links, or links to other websites, are appreciated by readers and do not negatively affect your SEO (as long as you are not linking to competitors). They also do not directly contribute to SEO, unless you look at it from a relationship/link building perspective. However, the most important reason to add them is for your reader and the greater good of society, which is something that your field should appreciate. External links to valuable information create better content. Period. If you aren’t convinced, watch Cyrus Shepard’s 6-minute explanation on SEOmoz (and acknowledge my use of an external link). Images with alt text are essential for two reasons. First, readers do not like huge blocks of content. We live in a multimedia world and demand bling with the black and white. Reading unaccompanied words is, like, so 20th century. Second, images (with alt text) have significant SEO value. Alt text describes what an image depicts to those who cannot see, like search engines and the visually impaired. Neither appreciates keyword stuffing in the alt text so be careful not to offend. It might cost you a donor or a place in the search results. Check out Reid’s article on SEO for images for everything you need to know on the subject. So, are you still afraid of SEO? There’s no reason to be. Implement these six tips on your blog and the results will make you a believer. If you have any questions or concerns, please use the comment forms below or find me on Twitter.